Abstractions of delusions: Smoking point for smokers in a non-smokers world! Smoking point for smokers in a non-smokers world! Paris reporter Hugh Schofield says attitudes to smoking have changed dramatically in France in the past year and any fears that people will generally ignore the new law can be discarded. The French health ministry allowed smokers a 24-hour "grace" period for the New Year festivities in a gesture of "tolerance". Any smoker caught flouting the ban thereafter can be fined up to 450 euros (£332; $662), while those who turn a blind eye to smokers on their premises can be fined up to 750 euros. France has about 13.5 million smokers among its population of 60.7 million. Restrictions on smoking also came into force in Portugal on Tuesday, but the rules were not as tight as in France or Germany. Portuguese bars smaller than 100sq m (1,076sq ft) can still opt to allow smoking. Public buildings can still have smoking zones, provided they are clearly signposted and ventilated. German restaurants and pubs have strongly resisted the bans, not only because of the potential loss of income but partly because of an earlier crackdown on smoking initiated by Adolf Hitler's Nazi regime. The sensitivity of the issue has prompted the authorities to allow special rooms to be set up purely for smokers. 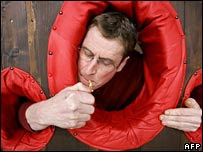 In Lower Saxony where a ban is already in place, chef Michael Windisch came up with the idea of a "smoking point", which he hopes will allow smokers to enjoy a puff without leaving the premises. The toughest rules in Germany are being brought in in Bavaria, where no smoking rooms will be allowed. Lighting up is also likely to be banned at the state's Munich beer festival in October.